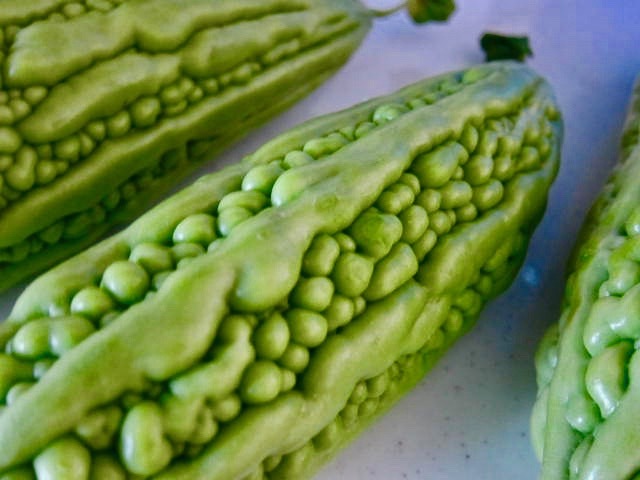 When the world was created and the first vegetable garden planted through whichever mysterious creature you choose to believe in, there was general agreement that the ugliest and worst tasting of them all should be given a special award. Thus, the bitter melon got so many health benefits that somehow, we must find ways of incorporating these into our diet. 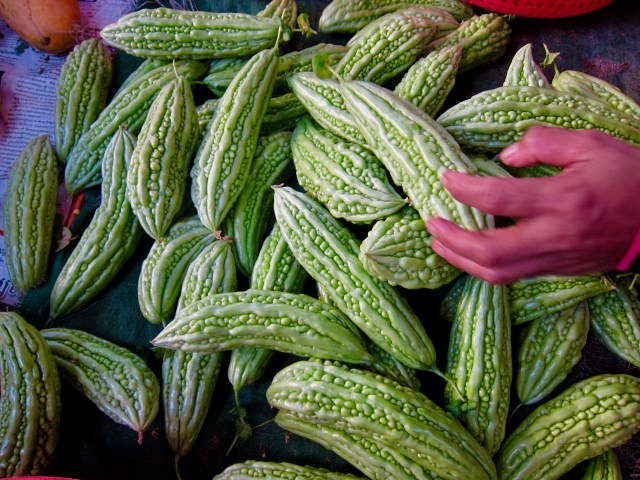 People talk about the bitter melon with a squint on their face and at least one horror story of having been taken by surprise when it was included unwelcomed in a salad or stew or mixed veg dish. It's like being surprised by a renegade durian even sharing the durians horrible exterior. Only parental threats of eternal damnation and a lifetime of pimples would induce children to eat this remnant of the melon family. True to its name, it is bitter and so foul tasting that every mother is convinced it must be full of healthful properties so year after year, decade after decade, dynasty after dynasty, Chinese, Japanese and other Asian children learned the ambiguities of life by being force fed this disaster of agriculture. 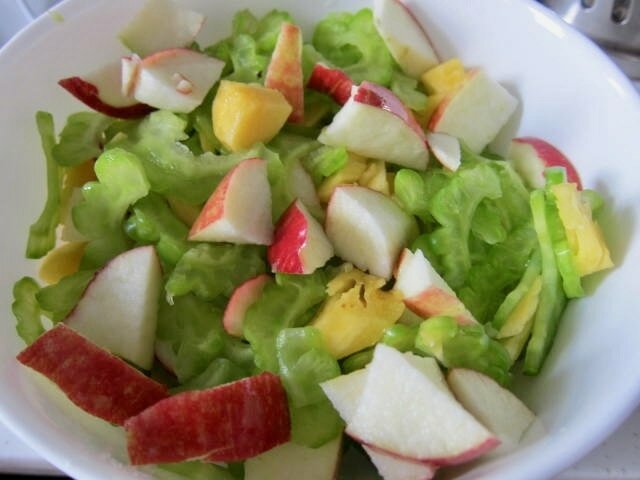 But if you are abandoned on a tropical island and the only thing you can eat are roaches or bitter melon, here are some ideas for perking up the melon. "Personally", my husband said, "I'd fry the roaches." The Chinese believe that bitter lemon clear toxins in your body and thus, give you smooth skin. In their traditional medicine, the Chinese not just use the fruit but also the roots and the dried vine. Note: This is recommended as natural food with health benefits and not to be taken as medicine by those who take medications for these problems unless you have had consultations with your doctor. 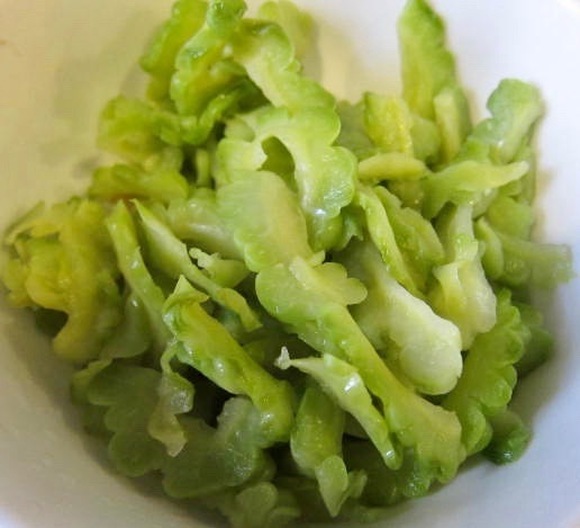 There are many ways of preparing bitter melon to make it more palatable to those who have not grown up forced fed with this. Slice the bitter melon lengthwise. Scrape the seeds and pulp. Cut it thinly or use a peeler and scrape it. It makes thinner pieces. 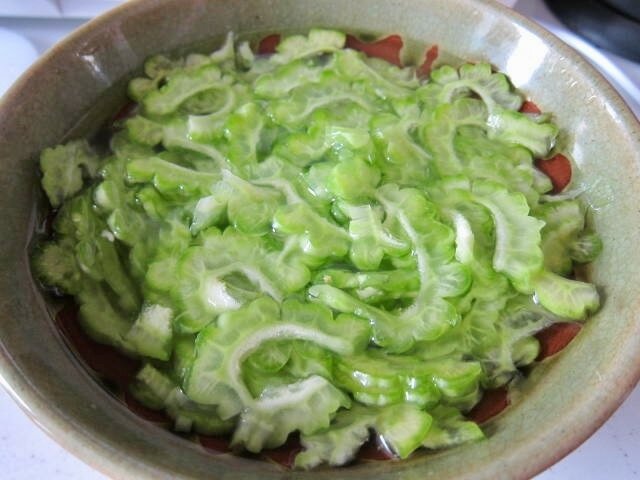 Add sweet vinegar, lime or for a sweet dressing. You can add finely sliced tomatoes and onions. Or, add cubed apple and pineapple. If you want pickled bitter melon, then don't add the tomatoes. This way, you can keep it in the fridge and just take out a bit each time to add to your meal. These days, because people have recognized the benefits of taking bitter melon, entrepreneurs have made tea out of the dried fruit. It is available in many Asian super markets. In other countries, bitter melon juice flavoured with honey is available. In China, they make bitter melon egg drop soup. I tasted the simple soup popular among the Vietnamese. They cut the bitter melon crosswise. Scrape the seeds and the pulp and stuff these cut pieces with meat and put them in clear soup. For those who want to try it, you can use a vegetable base and add these stuffed bitter melon to the soup. It is quite delicious. In the Philippines, some of the often prepared stews include bitter melon. I usually fry it first and then add the beaten eggs to it. Add a bit of salt and pepper and it's ready. In cultures where they eat rice for breakfast, it is a great addition to the meal. The Chinese often prepare bitter melon this way and somehow the black beans make it less bitter. You can also use pork ribs or shrimp.